Remote Tracking, Monitoring, and Notification Systems for Cat Powered yachts and vessels are here. 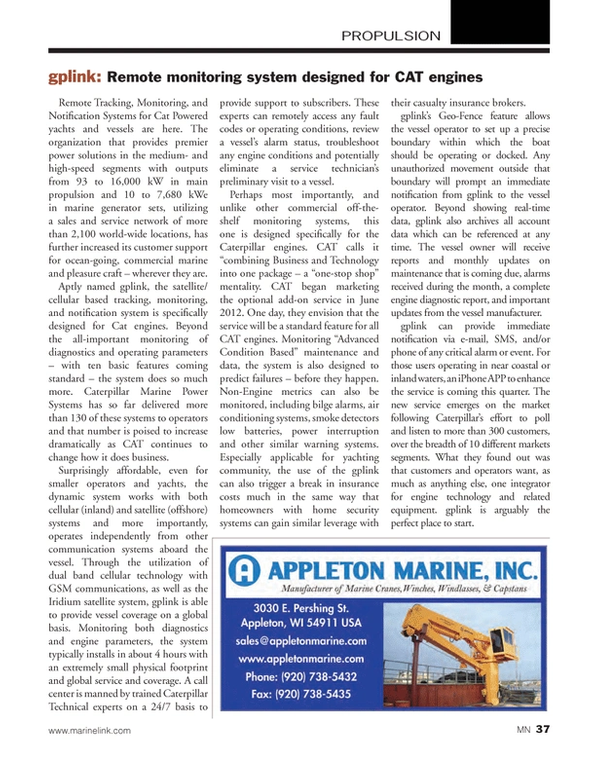 The organization that provides premier power solutions in the medium- and high-speed segments with outputs from 93 to 16,000 kW in main propulsion and 10 to 7,680 kWe in marine generator sets, utilizing a sales and service network of more than 2,100 world-wide locations, has further increased its customer support for ocean-going, commercial marine and pleasure craft – wherever they are. Aptly named gplink, the satellite/cellular based tracking, monitoring, and notification system is specifically designed for Cat engines. Beyond the all-important monitoring of diagnostics and operating parameters – with ten basic features coming standard – the system does so much more. Caterpillar Marine Power Systems has so far delivered more than 130 of these systems to operators and that number is poised to increase dramatically as CAT continues to change how it does business. Surprisingly affordable, even for smaller operators and yachts, the dynamic system works with both cellular (inland) and satellite (offshore) systems and more importantly, operates independently from other communication systems aboard the vessel. Through the utilization of dual band cellular technology with GSM communications, as well as the Iridium satellite system, gplink is able to provide vessel coverage on a global basis. Monitoring both diagnostics and engine parameters, the system typically installs in about 4 hours with an extremely small physical footprint and global service and coverage. A call center is manned by trained Caterpillar Technical experts on a 24/7 basis to provide support to subscribers. These experts can remotely access any fault codes or operating conditions, review a vessel’s alarm status, troubleshoot any engine conditions and potentially eliminate a service technician’s preliminary visit to a vessel. Perhaps most importantly, and unlike other commercial off-the-shelf monitoring systems, this one is designed specifically for the Caterpillar engines. CAT calls it “combining Business and Technology into one package – a “one-stop shop” mentality. CAT began marketing the optional add-on service in June 2012. One day, they envision that the service will be a standard feature for all CAT engines. Monitoring “Advanced Condition Based” maintenance and data, the system is also designed to predict failures – before they happen. Non-Engine metrics can also be monitored, including bilge alarms, air conditioning systems, smoke detectors low batteries, power interruption and other similar warning systems. Especially applicable for yachting community, the use of the gplink can also trigger a break in insurance costs much in the same way that homeowners with home security systems can gain similar leverage with their casualty insurance brokers. gplink’s Geo-Fence feature allows the vessel operator to set up a precise boundary within which the boat should be operating or docked. Any unauthorized movement outside that boundary will prompt an immediate notification from gplink to the vessel operator. Beyond showing real-time data, gplink also archives all account data which can be referenced at any time. The vessel owner will receive reports and monthly updates on maintenance that is coming due, alarms received during the month, a complete engine diagnostic report, and important updates from the vessel manufacturer. gplink can provide immediate notification via e-mail, SMS, and/or phone of any critical alarm or event. For those users operating in near coastal or inland waters, an iPhone APP to enhance the service is coming this quarter. The new service emerges on the market following Caterpillar’s effort to poll and listen to more than 300 customers, over the breadth of 10 different markets segments. What they found out was that customers and operators want, as much as anything else, one integrator for engine technology and related equipment. gplink is arguably the perfect place to start.